Protruding disc in the lumbar spine. 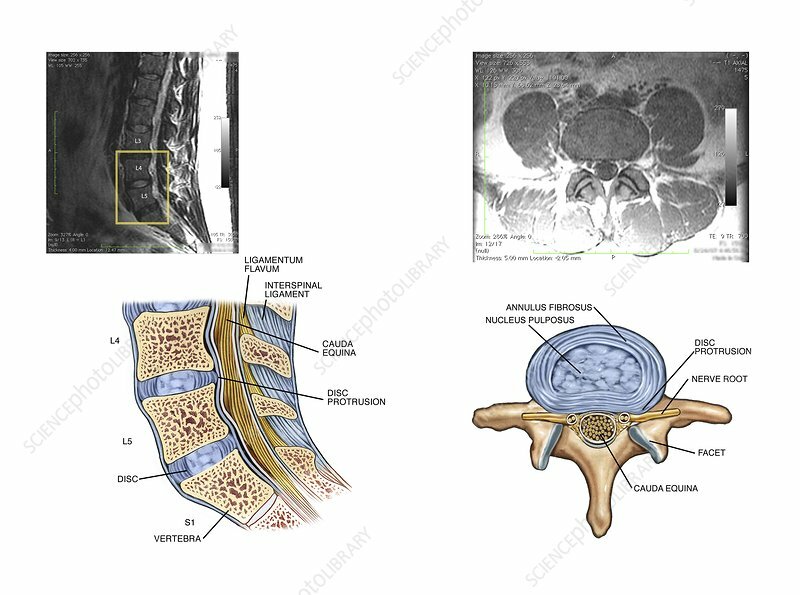 Labelled artworks and corresponding sagittal (left) and axial (right) MRI (magnetic resonance imaging) scans through the lumbar (lower back) spine showing a protruding disc at the L5-S1 joint. The axial view indicates the disc's outer ring (annulus fibrosus) has not been breached, but is pressing on a spinal nerve root. Also labelled are the ligamentum flavum, the interspinal ligaments, and the cauda equina (nerves below the lower end of the spinal cord). The fibrocartilage discs between each vertebra form spinal joints that bend and flex. Protruding spinal discs can cause pain and in severe cases may require surgery.